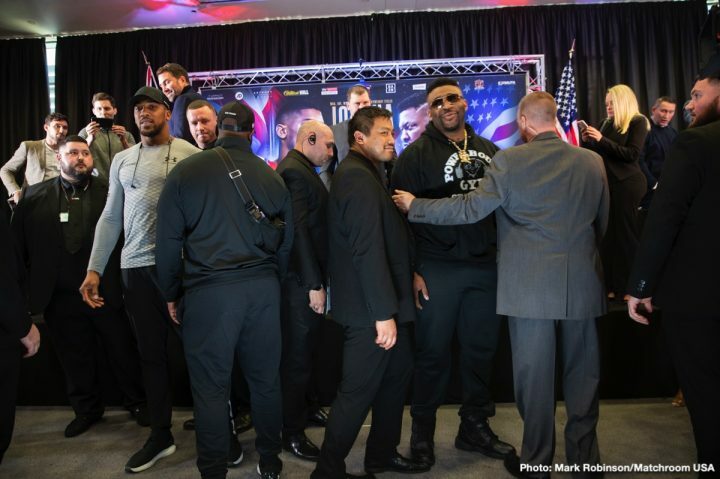 By Tim Royner: Jarrell “Big Baby” Miller is expecting Anthony Joshua to gas out after the fifth round on June 1 when the two large heavyweights fight each other in their well publicized contest on DAZN at Madison Square Garden in New York. The 300+ pound Miller, who is known for his high punch volume and fast pace style of fighting, plans on taking the fight to the stamina-plagued 6’6″ Joshua to wear him out quickly in the first half of the fight, and then knock him out by the seventh or eighth round. Joshua is built for short duration fights. With his heavy muscles, that look like something out of a bodybuilding competition, he’s not a fighter that handles fast pace fights well. You would think that Miller would have stamina problems too given how much fat that he’s carrying around on his large 6’4″ frame, but he carries the extra fat weight well. Miller’s heart can handle the weight better than Joshua’s. One problem that Joshua has is he’s put on a lot of extra muscle since he turned pro. Joshua was 220 lbs in the 2012 Olympics, and he weighed a little more than that when he turned pro in 2013. He quickly on 20 lbs, and his cardiovascular systems hasn’t handled the added weight well. It just goes to show you that a fighter may not always look like they’re fit, but they sometimes are compared to a guy with a bodybuilder physique. If Miller can put some pressure on Joshua, and handle his punching power earlier in the fight, then there’s a good chance he might be able to wear the 250 lb British heavyweight out to score a stoppage in the second half of the fight. If Miller can get Joshua to boil over in this fight the same way Wladimir Klitschko and Dillian Whyte did to him, he could knock him out after he gasses out. Joshua barely escaped those fights without getting knocked out. Wladimir looked too afraid to finish Joshua after he had him hurt in the sixth round in their fight in 2017. Whyte was injured with a left shoulder problem after he hurt Joshua in the second round in their fight in 2015. Miller has a lot going for him coming into this fight than Wladimir and Whyte didn’t have. Miller will presumably be healthy when he gets inside the ring with Joshua on June 1. Miller will be fighting at home in New York, unlike Klitschko, who made the calculated error of agreeing to fight AJ in England at Wembley Stadium. Miller is fearless as well. When he has a man hurt, he doesn’t decide to play it safe and box him the way Wladimir did when he had Joshua hurt. A lot of boxing fans are under the impression that Miller doesn’t hit hard. If you look Miller’s past fights against Bogdan Dinu, Gerald Washington, Johnn Duhaupas, Fred Kassi, Mariusz Wach, Nick Guivas, Tomasz Adamek and Donovan Dennis, he looked like he hits plenty hard. What Miller lacks in power, he makes up for with his high work rate. Being able to throw a massive amount of punches in every round, it makes Miller a real threat to Joshua, Deontay Wilder or any heavyweight division. Miller has a work rate of a well conditioned welterweight. In terms of Miller’s ability to throw punches, he’s an unusual heavyweight that hasn’t seen for a long time. Miller could be bad news for Joshua. Miller is the wrong kind of heavyweight to be fighting a guy with major stamina problems like Joshua has. If Joshua isn’t able to take Miller out in the first five rounds on June 1, he’s going to be an unhappy camper in having to deal with the fast pace he sets. Gerald Washington had some success early against Miller in their fight in 2017, but things fell apart for the 6’6″ heavyweight from San Jose, California, when Miller just kept coming and not backing off after the first four rounds. You could see Washington gas out quickly. By the eighth round, Washington had nothing left and the fight had to be stopped. Miller won the contest by pushing a fast pace that Washington couldn’t handle. If Miller is able to take Joshua’s early bombs on June 1st, he’s got a good chance of wearing him down the same way he did against Washington. Joshua is likely going to be boxing and moving like he did in his fight against Joseph Parker in 2018. Joshua will try and keep the fight on the outside so that he doesn’t draw into a war on the inside, which he’s not likely be able to win. It’s safe to say that the referee that works the Joshua-Big Baby Miller fight won’t be a guy unclear on the rules of boxing like the referee that worked the Joshua-Parker fight, Giuseppe Quartarone, who prevented inside fighting for the full 12 rounds. The referee pulled Parker off of Joshua when he would attempt to work in close. Joshua was given a big advantage over Parker by not having to fight him in close.